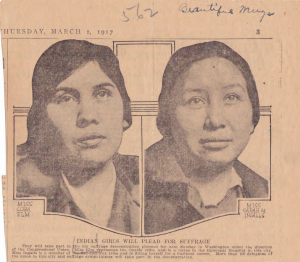 According to the application form in her student file, Cora Elm, an Oneida Indian of “full” degree Indian blood, was born on February 18, 1891 to her mother Jane Elm and her father Nicholas Elm. Her Oneida tribe was located in Wisconsin. 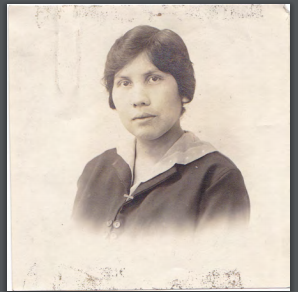 She enrolled in the Carlisle Indian Industrial School in October of 1906, and stayed for 7 years. Before she started school in Carlisle, she went to the Oneida (bdg.) School. After her stay at the Carlisle Indian School, she attended nursing school at the Episcopal Hospital in Philadelphia, in 1913. 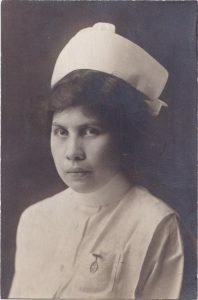 The picture below shows her in her nursing uniform taken at her graduation in 1916, according to the Carlisle Indian School Digital Resource Center. Several documents in her student file state that she had been a “splendid” student. A newspaper article from 1917 writes about her taking part in a suffrage demonstration in Washington D.C., representing her tribe (see picture below). According to the book “A Nation within a Nation: Voices of the Oneidas in Wisconsin”, she served as a nurse during World War I. Unfortunately, further research did not offer any additional insights into her personal life after her nursing school career. This entry was posted in Cora Elm, Tribal Educators and tagged Episcopal Hospital, nurse, nursing school, Oneida, Student Files, suffrage, Wisconsin. Bookmark the permalink.